It doesn't sound that thrilling on paper. A band plays basic, unfettered, rocking blues — closer to gutbucket than to the smooth, tame uptown stuff — cranks it up, adds a little rockabilly sneer, and in the process of honoring ascended masters like Hound Dog Taylor and Howlin’ Wolf, also pays sly homage to The Yardbirds and maybe even the Count Five and other ’60s garage crazies. Yes, that’s been done before. And yet, when it’s done right with plenty of spirit, there isn’t much that can beat it. 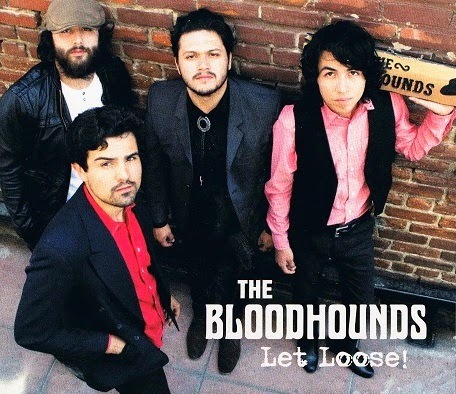 This is the case with a new band called The Bloodhounds. Their debut album, Let Loose!, despite all its obvious roots in the past, is some of the freshest-sounding music I’ve heard lately. The album comes bucking out of the stall with “Indian Highway,” which has an irresistible, bluesy guitar hook that evokes Bob Dylan’s “Obviously Five Believers.” As singer Aaron “Little Rock” Piedraita belts out the lyrics and guitarist Branden Santos makes his sonic offering to the voodoo loas of rock ’n’ roll, a listener knows it’s going to be a joyful journey. On “The Wolf,” the musicians prove that they are perfectly capable of slowing it down to a swampy groove. With Santos playing spooky Hubert Sumlin licks and Piedraita name checking various Howlin’ Wolf song titles, this sounds like “Wang Dang Doodle” for a new generation. There’s one song here that might someday end up as an advertising jingle in, say, Colorado, Washington, Oregon, or Alaska. That’s “Try a Little Reefer,” which features a cool Hammond organ. Besides their rocking side, The Bloodhounds sometimes slip into jug-band or skiffle mode. On songs like “Dusty Bibles and Silver Spoons,” “Hey Lonnie,” and the goofball “Olderbudwiser,” the group includes instruments like washtub bass, banjo, rub board, spoons, and kazoo. It’s good fun, and I’m a jug-band fan, but with three such tunes on one album, the novelty wears a little thin. But even with that nitpicking, Let Loose! is a dandy debut. I hope these Bloodhounds keep sniffing. 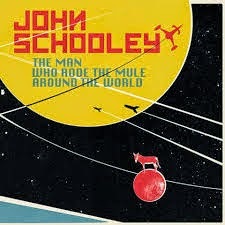 * The Man Who Rode the Mule Around the World by John Schooley. It filled my heart with joy to see a new John Schooley album — on Voodoo Rhythm Records, no less. It’s his first since 2007’s One Man Against the World. Some cuts sound like crazed blues, while others, like “Cluck Old Hen,” might be bluegrass from the Red Planet. Then there is “Poor Boy Got the K.C. Blues,” in which Schooley sounds like he’s been listening to John Fahey (though Fahey never used drums miked nearly that high). The title song comes from a great American trouba-dour and legendary drunkard, Charlie Poole. It’s a surreal little hillbilly classic with lyrics like “Oh, she’s my daisy, she’s black-eyed and she’s crazy/The prettiest girl I thought I ever saw/Now her breath smells sweet, but I’d rather smell her feet/She’s my freckle-faced, consumptive Sara Jane.” Schooley and Daniels soup it up into an eardrum blaster, jamming like madmen until the last minute or so. It’s sheer feedback squall. Charlie Poole meets Metal Machine Music. I love it! Truly, this is my kind of youthful music from the jungle. It’s even denser, crazier, and more voodoo-fueled than The Chicken Album, his previous record from Off Label Records (a German company specializing in wild sounds from across the planet). The new album actually has just as many chicken songs (“Chicken Style,” “Chicken Groove,” and “Fried Chicken Blues”) as The Chicken Album. 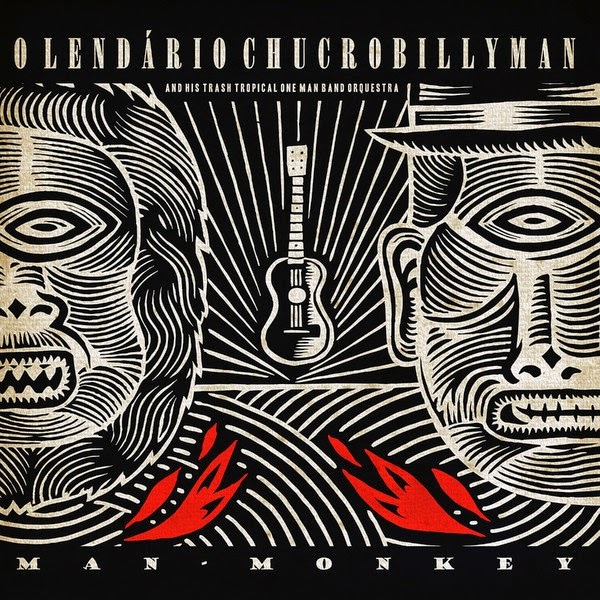 The poultry-obsessed Chucrobillyman also likes jungle songs. Here we have “Midnight Jungle,” an instrumental featuring wild rhythms and animal noises, and “She Lives in the Jungle,” a spooky blues stomper. My favorite on Man Monkey is another jungle tune called “The Trip of Kambo.” Kambo refers to a traditional shamanic medicine made from the secretions of a giant monkey frog, which has been used for thousands of years by native tribes in the Amazon. Kambo sounds downright psychedelic with this musical backdrop that reminds me of some of Louisiana hoodoo rocker C.C. Adcock or Tony Joe White’s swampier excursions. Here's John Schooley live at Beer Land in Austin, where I saw him play with Walter Daniels and Ralph White a few years ago. And here's Chucrobillyman playing "Rollercoaster Love."